Oxford street, the survivalists guide. 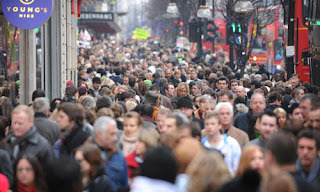 Oxford Street is as unavoidable for the average Londoner as springtime pigeon poo, errant tube lines and those mysterious moving road works (has anyone checked for ley-lines?). 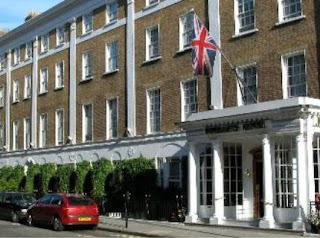 Even the well heeled may find themselves girding their loins to face the place, even if it is only to cross from Marylebone to Bond Street. If anyone doubts that a shopping 'trip' to Oxford Street is occasionally akin to an assault course please see the image below. Some might bellow that there are alternatives. However shopping malls are not central, Croydon is full of roaming feral groups of teenagers and Wood Green is the last resort of the truly desperate. The fact remains that the UK has the best fashion-forward High Street retailers and that most of these house their flagship stores with the widest range of lines on this thoroughfare. The shopping survivalist can, however. make a day spent here more pleasant. Through planning and distraction combined with an avoidance of the myriad irritations and dangers of the place a good day can be had. Redlegs lists her own do's and don'ts below in the hope they may help. These are my own tips, I would be extremely interested to hear other suggestions. After all we need all the defensive and offensive weapons we can muster to survive a DAY IN OXFORD STREET! 1 Timing. It sounds obvious, but if you have a choice do choose a weekday and arrive early. I really don't understand the large numbers of obviously retired grey haired elderly ladies heading to Oxford street for their Saturday jolly. Inexplicable. Particularly slack times of year in terms of crowds are late February/early March and late September early October. Remember though that just before Mother's Day and other such events things get busier. Bank Holidays are also a no-no. Under no circumstances go on one of the special pedestrian friendly no-traffic days. They are not pedestrian friendly, buses and cabs do a great job of getting stupid big groups of people off the road and walking. In their absence there are five times the amount of people, often from outside London behaving like human dodgems. 2 Sustainance. Every cafe in the area seems to be full of noisy families and obtaining a place to sit requires the ruthlessness of a crack SAS unit. The Selfridges food hall is like a Japanese train station at rush hour and the fast food chains are unspeakable. There are alternatives. My tip is to spend a little more and go to John Lewis's Brasserie (tel 020 7629 7711) . Largely because you can actually reserve a table and swan in past the queue and sit right down for a nice light waitress served meal with a glass of wine. If you are in the lower end of Oxford Street and fancy solid cheap grub, head down Berwick Street and grab some delicious cod and chips in the utilitarian fish and chip shop there. I have always been able to sit down and Soho tends to discourage the yummy mummy hordes. 3 Walk behind the street itself, the pavement is full of idiots. You can avoid the elbows, hard faced Primarkadonnas with prams, battalions of chadors, large men with beer cans and gaggles of shrieking European teenagers just by following the streets running parallel to Oxford Street itself. Slightly longer in footfall but twice as quick and far less stressful. 5 Treats. My habit is to reward myself for my powers of shopping endurance. A favourite is afternoon tea at the Durrant Hotel, one of London's last family owned Edwardian hotels. Quiet, rarely crowded and full of antiques; between 3-6 they will serve a full Champagne afternoon tea for a very reasonably £21.00. 6 Remember there are some joys to be found in Oxford Street even at its busiest. The Hare Krishnas whirling along raise my spirits with their combination of jolliness and longevity. They seem to have always been there. The frontage of Selfridges, the fifties modernist sculpture outside John Lewis', the roast chestnuts that are hygienically highly dubious but never seem to poison you and the proximity of wonderful establishments such as Claridges. Let's not forget that very few shopping streets of this type end in a fantastic royal park. The new Tokyo style cross walk at Oxford Circus is very effective and shows the place can be improved. Most Londoners are aware of these but for those who don't regularly visit the street..
1 Sundays. Due to UK shopping rules the first hour/hours on Sunday you can only view goods and may not be able to buy them until 12.00. 2 Pick pockets work in teams and are very sophisticated. Black spots are outside Selfridges and Primark. Also the exits of Tottenham Court Road and Oxford Street Tube Stations. Never give to beggars, they are used as scouts to show where you keep money on your person. 3 A common theft in Oxford Street is bag lifting. Some one will stand by you at a counter, you put some bags on the floor. They do the same. Then pick up their bags along with a couple of yours. They will then return your goods for cash. This is also common at fast food and coffee chain shops. Don't put your receipts for goods in the bag especially if you have used a credit card, if you get back to the shop quickly they do sometimes catch these people in the act. 4 The Tottenham Court Road end of the street has virtually nothing worth visiting or shopping at and is tatty. Best avoided. Any comments or suggestions please reply! Ever since returning to Blighty back in '05 it seems the high street has been awash with a cut that veers somewhere between 1960's baby doll ingenue and Jane Austen Empire line. Fashion is fickle but to be quite frank I am surprised this particular cut has maintained its popularity within younger brands and cheaper stores. 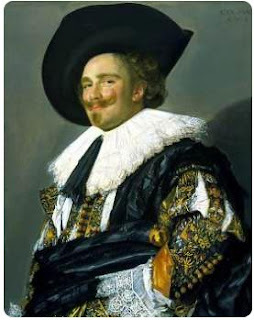 ".... the British are in the grips of their own special fashion delusion: the smock. Sometimes it takes people from other cultures - such as men and foreign visitors - to point out that there's something absurd going on. The first warning came from my husband, who jovially exclaimed in the pub: "Oh look, have you seen? That girl from EMI's pregnant." "No," I hissed. "It's a smock. Fashion." The second came from a Los Angeles Times journalist whom I sent to Topshop during London Fashion Week. The next time I sat next to her she said: "When did they turn it over to maternity wear?" I hate the smock. Only babies should wear them; grown women, never. Last time they were in fashion - about 1970, I seem to remember - only teenagers (and pregnant women) wore them, and then with long skirts or flares. Teenagers in those days were flat-chested. Women now are not, and the ubiquitous wearing of under-wired double D-cup bras renders the 2007 smock look, well, pregnant, or at least sleazy in a What Ever Happened to Baby Jane? sort of way.'?" I concurr. The ultra gathered smockiness has been superceded by the complete dominance of the high waistline. This cannot be blamed on haute couture or designers. Their collections have contained a plethora of shapes and cuts. Who, also can forget the influence of designers such as Westwood or Mouret who champion waists and hips? Notably the high end high street retailers who cater for an older clientele have dresses with waists, sadly their prices exceed my current spending power. The blame for this continuing slavishness to the shape can probably be laid at the feet of the current crop of teenage style leaders, the least stylish since those who inhabited the mid 70's. When, come to think of it, this shape denying cut was last dominant. Perhaps the super skinny feel that being by wearing clothing that is unforgiving to all but the borderline anorexic they are showing off their slimness? The problem is they can still be skinny and pregnant. Men now resist asking apparently pregnant women if they would like a seat on the tube, as the bearded one has complained it is impossible to tell if someone is up the duff. The genuinely bun in ovened who often have to adopt tents are being deprived of comfort by their sisters' poor fashion choices! Fashion magazines of the cheaper kind also don't help as their stock response to the size 14 -18 lady in their make-overs are routinely dumped into some form of tailored smock over skinny trousers. This is partially due to the percieved unfashionableness of the wrap dress. The wrap dress is of course genuinely skimming and flattering; why has this become de trop and the fabric equivalent of a balloon suit remained popular? Is it something to do with the times? surely recession tends to breed interesting fashion, think of the stylish recessions of the past. Maybe this white collar recession has not bred rebellion and edge but a big national whinge of 'why me?' Perhaps this urge to look like fat, childish creatures is a call for help. Who knows, all I know is that it is boring the hell out of me. I suspect it is one of the factors, along the popularity of a hundred shades of griege, that has driven me towards retro and vintage influenced styling. The baby doll look had some element of novelty in the 60's on a Bardot, but now it simply looks a bit skanky. Somehow our so called 'it' girls don't look like fresh ingenues like Julie Christie but just inelegant. It is about time someone called time on the whole thing and that the high street realised it's important, mid-level, 30s-50's customers are not being served. It is about time we told them all to 'SMOCK OFF'. 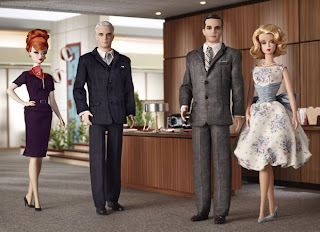 Barbie are launching a collector's edition of it's dolls based on the superb US television series 'Mad Men'. There is a picture above. As ever the Male dolls don't quit cut the mustard. The Don Draper one looks more like a character from 'Twilight'. I am, however, fascinated by their effort to produce a middle-aged man doll . Personally I think it is probably well nigh impossible to capture the caddish silver fox that is Roger Sterling in all his droll dry glory. His doll looks most peculiar, like a cadaverous Steve Martin. Faces aside the suits don't work, perhaps because men's tailoring, especially of this era, requires movement. And these man dolls are unlikely to be arranged in louche lounging positions due to the limitations of Barbie limb articulation. More to the point, the required accoutrements: a cigarette or a tumbler of whisky are rendered impossible by the prudishness of the manufacturer's home nation. The ladies are more appealing. Betty Draper, the most tedious female character on the show is virtually a Barbie anyway, albeit a frustrated and trapped suburban one. The frou frou fifties prom style dress and the Grace Kelly swirl of ice cream hair look completely appropriate. The character is a doll. 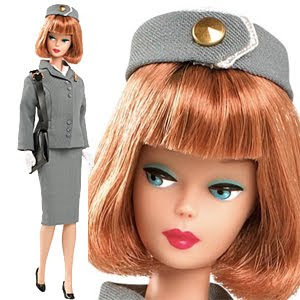 The Joan Holloway doll is a little disappointing, it seems Barbie did not have the guts to represent the voluptous gorgeousness of the sharp sassy secretary. The hair and dress design are, however, charming. I'd have liked a Peggy, but expect a comparatively plain yet intelligent character might be a step too far... The dolls have a special ceramic style finish which is interesting and they do at least seem to have the right skin, not the colour of old prawns favoured by the modern Barbies. Despite the carping I do sort of covet the Joan doll, but only sort of. 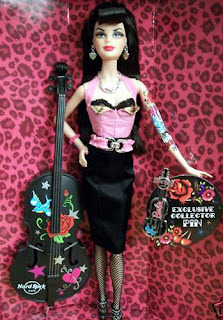 Actually I would rather have Pan Am Barbie, or raunchy rockabilly Barbie if I were not too old for dollies. This post was not intended to be about disappointment but I feel let down that the Mad Men style seems to have had more effect on menswear. My friend Laurence was wearing a wonderful suit last weekend which echoed that rat pack styling. The beautiful curve hugging dresses, wonderful rich colours and elegant shoes worn by the female cast do not seem to have had much of an effect, but when they do it is ruined by odd tailoring. This dress (pictured below) from Phase Eight looked promising but was far too short and the waist was, quite unlike the photograph, high. I am hoping that fashion is being slow and that Autumn/Winter '10 on the High Street will see a feast of lovely clingy tailored frocks; but I am not holding my breath. Dogtooth Dress from Phase Eight. I was cogitating on the fact that there can be a great deal of conformity with vintage and retro inspired sub-cultures. I am impressed but faintly bemused by the activities of re-enactors, even more impressed by all those superb dancers and frankly intimidated by the sheer number of highly elegant people I meet. We are all, to some degree unique, even if it simply boils down to our DNA. But like other groups of people with similar interests there are totems and signs of allegiance which point to someone being retroesque with the accuracy of an exocet missile. What might these tribal markers be? What is the retro equivalent of say woad ? I list my own suggestions below. 1 Cherries. Not necessarily as in pies or coke, more as a visual garnish. Whilst pineapples are pleasantly Carmen Miranda and Chillies have their own red hot mama connotations it is the Cherry which is the only fruit. Those rockabilly chicks started it. Personally I hate cherries as sustainance, but I do have a dress covered in them. 2 Spiky things all over the carpet, behind the sofa, under the bed in fallen battalions and if you are really unlucky: in that beef hotpot you made for your other half last night. I refer of course to the kirby grips, bobby pins and vary other spiky little objects which we require for our pin curling and tress fastening. 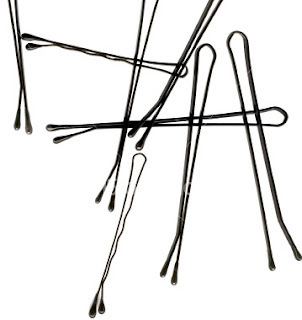 They are the essential foundations to our complex hair constructions. However they have a nasty habit of dissapearing when you need them and reappearing in legions when you want to tidy up. If you encounter them in a retro chap's lair, he is either cheating on you, you are moulting them or he is a cat burglar. 4 Tattoos. Bit of a controversy this. The retro-bores insist it isn't authentic and that Laura from Brief Encounter would drop her handbag in horror at the idea. The fifties rock types have embraced Las Vegas like trad tatts with enthusiasm. Many fall somewhere inbetween. So many find themselves in the scene via punk, garage, goth routes that many arrive inked. Personally I think, unless an actor or a passionate re-enactor drawings on your skin are fine. I'm going to write on friend's tattoos and post their suggestions so watch this space. 5 Vibrantly coloured hair. Let's face it. Our hair does not match the past. Women used to spend time on their locks and vintage clothes just don't cut the mustard without a strong hair colour. If you naturally have it, wonderbar, if not, it must be dyed. And what is the point of that if you don't actually have it dyed a discernably different colour? So we end up sitting in a salon with a pile of foul smelling gloop being deposited on our hair. Some have gallant gentleman who offer to do it at home. My lovely man has offered to do so but I suspect he simply wants to make my hair stick out at ridiculous sticky right angles and have a laugh. 6 A thick skin. Most of the comments you get when out and about are positive and even if Dita! being yelled at a brunette might lack originality it is hardly insulting. Humourous comments are fine but there is the odd rude or idiotic comment and more than a few stares. I am amused that a lady in red lipstick, a dress and a hat is more astounding to most than the most tattooed and pierced and punky cybergoth. Then you get strange comments from women who seem to resent the percieved effort you have made or regard your approach as being reactionary. Ironically it takes longer to be contemporarily dressy with all the hair straightening and leg browning and fake eyelash-applying. As for the accusation of reactionary or right wing tendencies, feminists made a stand so we could wear whatever we want rather than as little as possible. And I am a socialist to boot. 8 Bright red lipstick every vintage girl's gotta have it , especially Mac. Simply because Mac do good rich pigment matt sticks. I was planning to compose an 'every red lipstick in Selfridges' report but fear that I would rapidly end up looking like the scary clown in Stephen King's 'It'. 9 A 'signature' cocktail. I'm not suggesting there is anything wrong with a glass of wine, a jug of trappist brewed pilsner (although there is plenty wrong with mass produced lager) or a tankard of real ale. Indeed a tumbler of whisky, a la Mad Men has it's own appeal. Cocktails however match all outfits and eras. Thirties elegance? sip a Brandy Alexander. Forties zing? a Martini or Margarita. Fifties pzazz? a jamaican punch topped with pineapple and a plastic monkey. Again a certain strand of vintage lady is too concerned about her image, or feels her own grandmother went no further than a small sherry and demurrs. How dull. I really don't like people who are tee-total, it's my personal prejudice. There are, of course, those poor souls with no choice due to allergies and intolerances. But being tee-total isn't like being vegetarian or vegan. Most seem to adopt it because they are scared of themselves, have no faith in others or are religiously extreme. A friend of mine said yesterday that fruit juice is for vodka. Cocktails are for fun. Make mine a white lady! 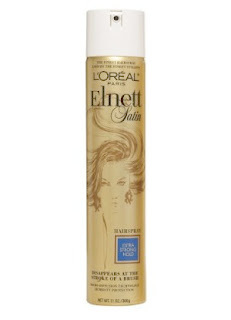 10 Elnett hairspray. Whilst I would like to aspire to smell of any number of lovely fragrances from even lovelier bottles, my presence is, I fear betrayed by the niff of the wonder spray from France. Nothing works as well as Elnett and even the packaging is pleasingly retro. It holds hair rigid and brushes out most easily. Of course you can taste the stuff for ages but the smell is evocative of generations of women. Funnily enough it is one of the few hairsprays that doesn't make this mild asthmatic hack and cough. Bugs also dislike it which is rarely a bad thing. Well those are Red Leg's suggestions as to what might constitute the vintage mavens 'must haves' but it is simply personal opinion, what do you think ladies? Plastic Fantastic! jewellery made of plastic. I tend to get side-swiped with jewellery. I enter shops determined to buy that much needed skirt, or if I feel really motivated a pair of trousers. The problem is that subconsciously I cannot escape a basic physiological anomaly:the possession of a waist. It is a truism that in Britain dietary changes mean that the differential between hips, bust and waist is rapidly evaporating. However it hasn't in my case, additionally I am cursed with child- bearing hips and a more than ample prow. This means that finding clothing can be a tiring and lengthy experience. The presence of revolving towers of glinting glass, winking brass and frilly ribbons that wait to tempt me in nearly every store is an irresistible distraction. Even Sainsburys sell jewellery, although as they compete with cheese, wine and chocolate the temptation is easier to resist. Nonetheless I have a lot of jewellery, particularly earrings. I am also indiscriminate in my taste. Ethnic beads, pearl studs, dangling stones and gem encrusted skulls all find a place in my jewellery box;although I seem to wear the same pairs repeatedly. And there seem to be a remarkable amount of single ones, they are like socks and mysteriously resistant to staying in pairs! 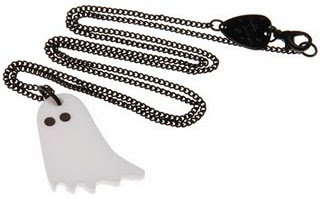 My little ghosty Tatty Devine necklace. I do have a few distinct preferences. One is for plastic, as a fan of vintage naturally I hanker after bakelite bangles, 1940's fruit brooches and 50's clip-on disks. However it is a material that has become popular again in terms of contemporary design. This is largely, I suspect, the result of the efforts and popularity of Tatty Devine's pieces as she seems to me to have championed the use of plastic as a fun, creative jewellery medium. This company has a couple of shops including one centrally in Covent Garden and also sells on-line. I had been after their ghost pendant for a while having seen a friend wearing it. Fortunately I received one for Christmas and it garners comments every time I wear it, children are particularly intrigued which means they shut up which is a good thing. The company has certain motifs they continue to produce but they launch sporadic new collections. I was very taken by a range based on those most monochromatically stylish and maligned birds: the Magpie. I luckily also received a pair of magpie stud earrings for Christmas from the same jewellery fairy. The stuff seems expensive considering the perceived cheapness of the material. Indeed cheaper items which are obviously inspired by this company's designs are available from Topshop and other fast fashion outlets. However these lack the wit and the originality of Devine's designs. 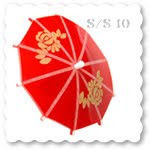 A new range, based upon paper parasols is particularly stylish because they offer a great combination of retro-verve and contemporary design. Colourful, they have a summery vintage feel and will compliment 50's dresses and rockabilly styles such as the clothing produced by Vivien of Holloway. The barrette in particular is going to look superb fastened to the side of an up do and I expect to see lots this summer. Another company similarly utilising plastic and new materials is Paraphernalia. They produce pieces based on a seemingly simple material, images laminated within plastic. These, however, are real conversation pieces. Anatomical drawings of hearts hang from throats, Marmosets peek from brooches and Galleons set forth to explore the new world. I expect their Alice collection to do particularly well in the light of 'Alice fever'. Again this stuff is not cheap but it is original and the price very reasonable for its striking qualities. The look can be challenging but it fits in particularly well within a nouveau-Victorian, steam punkish look. 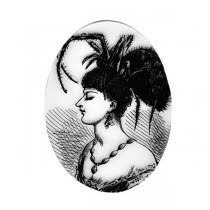 My personal favourites are the brooches which are based on Ernst's illustrations from his famous revolutionary graphic books. This are sinister but appealing and I think 'deadlier than the male' is a fine theme for any feminine accoutrement. However the designs are not all as charmingly gothic, some are simply extremely cute. 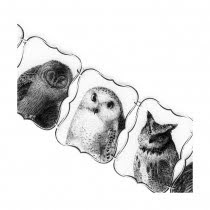 The animal items, particularly the bracelets (one of which is shown below )are lovely and likely to elucidate 'ooohs!' rather than 'oh!' . 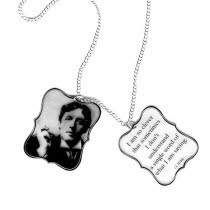 Another set of designs suitable for bluestockings are in the 'bon mot' range; charm necklaces which feature the portrait of a writer alongside a famous aphorism or quip. Oscar wilde's words of wit dangling from your neck.. I have been talking so far about modern producers of plastic jewellery, but for those who want to spend a little more and get something special there is nothing more iconic than a Lea Stein fox. Lea Stein produced her most famous designs in the 70's and her company continues to manufacture high quality plastic jewellery to this day. They combine a mid century aesthetic with elements of fifties fun and more than a dash of 20's and 30's style. Although her dog and cat brooches are charming it is the fox that is collected,quite obsessively, by some. 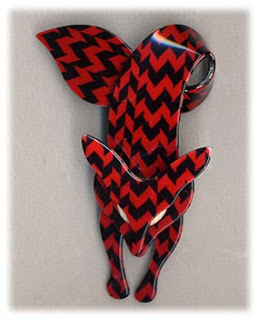 There are sought after colours and types of plastic, different coloured eyes and even patterns, such as the harlequin. All however conform to the classic Stein fox design. They look absolutely fantastic against a fur collar or a dark background. Really a Lea Stein fox is the only jewellery you need to wear, they are quite large. But be warned, someone is bound to wander up to you, jab at your breast and start conversations about it. Expect to pay any where between £80.00 -£150.00 but this is for a piece of named costume jewellery. 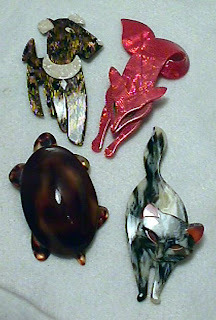 A selection of Lea Stein animal brooches.